Yep. Just two. That's all ya get, you book-loving beasts! Tee hee. Actually your tiny tots get them, because these books are just the bees knees for the toddler and preschool-K set. First up is the brand spankin' new 'Fall Ball' by the awesomely cool Peter McCarty. The guy responsible for 'T is for Terrible' (Julia loved this one when she was about 3ish) and 'Hondo & Fabian'. You should see the page where all the kids are sort of floating up in the air after their bus catches some air over a speed bump. Love his art! The gist is that fall = football. (Wrong. It equals pumpkin doughnuts.) And if it gets too dark and too cold to play football, you can cozy up inside and watch football. Adorable. 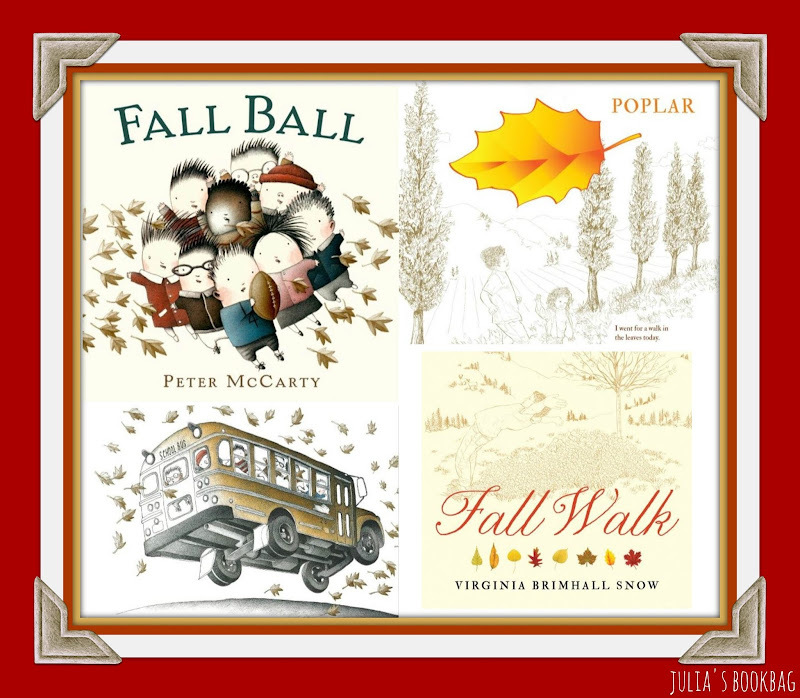 And then I recently flipped through 'Fall Walk' by Virginia Brimhall Snow. Um, Ms. Snow? YOUR NAME IS AWESOME. And then at the end, directions are outlined on how to press and rub your own fall leaves. I would love to dip fall leaves in wax or parrafin or whatever-the-hoo you're supposed to do with them, but I never ever have. I think the only activity I did with fall leaves is to press them in between pages of a book. And then I would throw the leaves out come spring or when I stumble on that page again LOL Such sweet illustrations! Love how the little kids are drawn! Aren't they fun? I love that guy's art style!! Happy Fall! I haven't seen either of these books. Sigh. I love fall. The weather cooled off a little, but it's still going to be in the 80s. I'm waiting for REAL fall. Um, are you on Momfilter again today? I LOVE that book!!! It's so beautiful!!! These look like wonderful stories! One of my favorite winter books (wrong season, similar style) is Snowflake Bently by Jacqueline Briggs Martin. Hi Gabrielle!! Oooh I don't know that one, I'll have to go seek it out.....love a good wintery book!